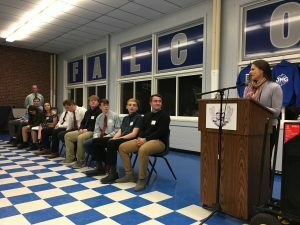 RUMFORD — Nineteen Mountain Valley High School students have been inducted into the Jobs for Maine Graduates program. The ceremony was held Thursday at the school. The program partners with public education and private businesses to offer results-driven solutions to ensure all Maine students graduate, attain post-secondary credentials and pursue meaningful careers, according to its website. 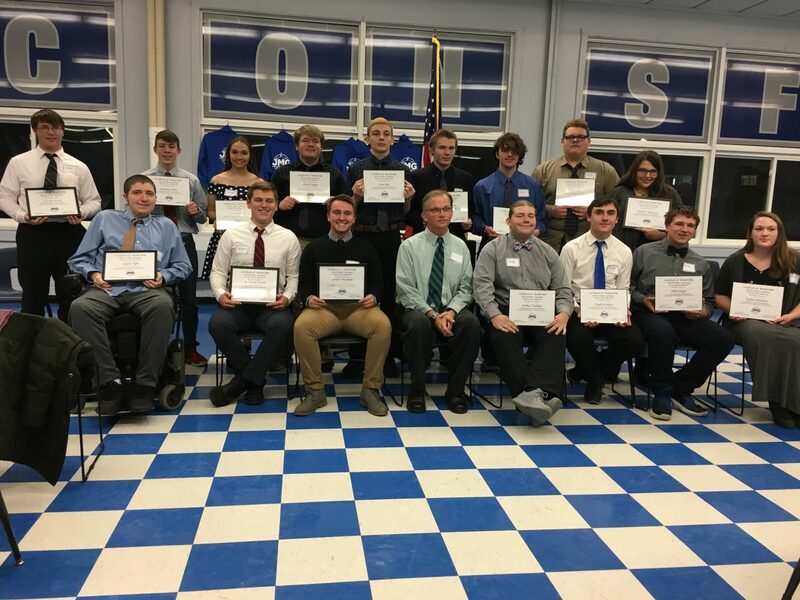 Inductees are: sophomores Matthew Miles, Joe McCarrick; juniors Hunter Blauvelt, Jennifer Boudreau, Rian Gallant, Allen Hagen, Josh Hodsdon, Kelsea Marston, Trinadi Milligan, Averie Pingree, Evrit Roy, Noah Stickney, Jake Thibeault, Trey Tubbs, Chanse Whyte; and seniors Montana Verill, Isiah Dogerty, Robert Machado and Logan Viger. Last spring, Principal Matt Gilbert hired Larry Thornton as the school’s JMG job specialist. With their guidance, along with other key educators such as Dean of Students Jim Aylward and guidance counselor Trina Fortin, JMG students receive mentoring and help to learn skills needed for their futures. “No matter the career path that these students choose, there are key skills and traits that lead to their success: showing up, working hard, and being coach-able are three of those most basic traits that are vital in today’s work culture,” Thornton said at the ceremony. Several students took their turns at public speaking during the presentation: Juniors Hunter Blauvelt and Noah Stickney explained what JMG is. Juniors Trey Tubbs, Kelsea Marston, Trinadi Milligan and Averie Pingree introduced speakers Gilbert, Rumford Town Manager Linda-Jean Briggs, Regional School Unit 10 Superintendent Deb Alden and state Sen. Lisa Keim, R-Dixfield. Junior Jennifer Boudreau introduced JMG central manager Sherrye Haney, who led the induction ceremony. Following their induction, students shared what the program has taught them and what they’re working on. “(JMG) will help me get organized for the future and get a job, and kind of see options for the future,” said junior Jennifer Boudreau, who plans to be an elementary or middle-school teacher. Senior Robert Machado said the group is gathering food for local pantries and holding a food drive at the school to help their community. “It’s the holiday season and winter, so some people are lacking for food,” Machado said. With help from community businesses, the organization is able to offer prizes for those students who bring in food for the food drive, he said. Sophomore Joe McCarrick moved to Maine from Arkansas in August and joined the JMG program because he “wanted to do something new.” He said it teaches students to respect themselves and others. After high school, he plans to join the U.S. Navy as his sister has. McCarrick’s mother, Brandie Wingfield, was excited about the program.